Kat’s gig with Amazon in Kentucky begins September 23. We’re 600 miles from Campbellsville with a couple of stops along the shores of Michigan’s great lakes scheduled. We’ll camp at another casino or two on the road south, maybe visit the AirStream factory in Ohio, and probably catch a baseball game in Cincinnati. There are no National Parks on the way, but Ohio has some nice state parks in the Passport America program, meaning they’re scenic, and affordable Sunday through Wednesday. Tonight is our last in Sault Ste. Marie and it’s been a lovely week of relaxation. Pink hurt her foot Thursday, probably from her habit of diving off the sofa when we put a key into the door. At first we thought it was her wrist, and she was much better Friday. Then the foot puffed up twice its normal size and she didn’t want to move. Weekend vets haven’t been invented yet here, and Pinky in pain made for a long weekend. Monday morning they did x-rays and diagnosed a soft tissue injury to that paw. Prednisone and painkillers turned her around in 24 hours; our old buddy’s spirits are nearly back to normal. Sault Ste Marie was a fine place to do nothing while she convalesced. But we did something. We replenished supplies at Wal*Mart, which now is our neighborhood grocery. Seriously, they’re pretty much the same everywhere, except that grits and Mary B biscuits are hard to find up north. We also cooked and ate well. I mesquite-grilled a porterhouse with garlicked sea salt and hammered black pepper. It was perfect with fresh Wisconsin corn. Kat baked a blueberry and toasted walnut bread pudding that was so good it didn’t need whiskey sauce. Yesterday we grilled salmon filets over oak with a blueberry agrodolce (the New York Times’ term for a spicy fruit, vinegar, and butter sauce) accompanied by a mushroom couscous. Tonight? We’ll probably enjoy leftover pot roast with a side of strong thunderstorms. Severe weather is forecast; may nothing that falls be solid. Tomorrow we are off to St. Ignace and another Kewadin Casino. I’m due for a few good hands at the blackjack table. I’ll tell you how that comes out, but neither of us should hold our breath. the salmon looks wonderful, the blue berries are prolly way better than local La. 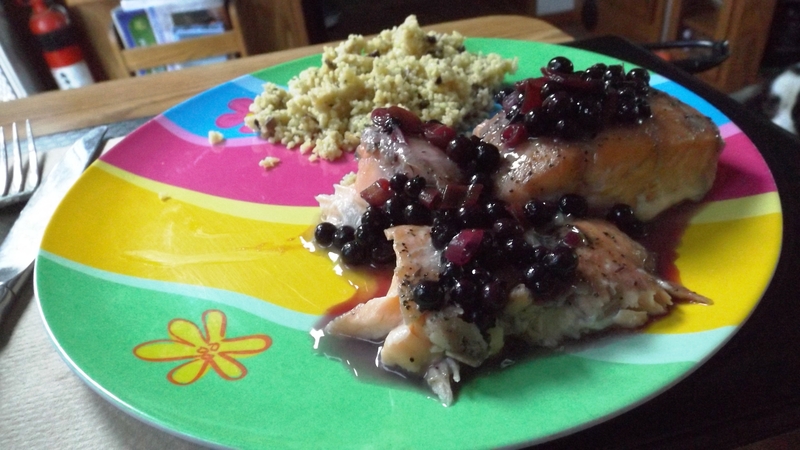 I oft times will use balsamic vinegar and blackberry Smply Fruit preserves on broiled salmon which is quite tasty. Wild blueberries are better than cultivated… smaller, but tastier and easier to use in most recipes due to their lack of size. Wish we could have come by some wild salmon, but what we bought was plenty good. Being able to pick them off the bush, rinse, and use ’em in a recipe within an hour of picking is priceless. And that goes double for raspberries.